In the area of business loans, you have several options that you could potentially go with. As a business owner, you have to consider all your options. If something makes sense financially, then you have to at least look at it. One option that is starting to make a lot of financial sense to some is a peer-to-peer business loan. Peer-to-peer business loans have been picking up steam lately and many business owners are using them to get the money that they need for operation expenses. Here are a few things to consider about peer-to-peer business loans and how they work. A peer-to-peer loan is when one business loans money to another business directly. There is no lender involved in the process and can benefit both parties. The deal can be set up directly between the two parties involved. Many times, there is a middleman that actually helps set up the deal. They administer the loan payments and take care of the contract between the two parties. These peer-to-peer companies take a fee for their services and they take care of all of the details. No lender involvement- The biggest advantage of a peer-to-peer business loan is that you do not have to worry about dealing with a traditional lender. You do not have to jump through all of the hoops that come with getting approved for a typical business loan. You can deal with someone on a personal level, instead of a faceless loan company. This aspect of peer-to-peer loans makes them very enticing for many borrowers. Bad credit approval- Even if you have a negative credit history, you can still potentially get approved for a peer-to-peer loan. With most peer-to-peer sites, people actually get to bid on the loan proposals. Therefore, it might take a higher interest rate to get the job done. However, it could still get done where banks fail to loan money. Help others- If your business has a little extra money, you could really help another fellow business owner out by lending it to them. You will be able to help yourself by getting a nice return on your investment. At the same time, you can help someone else get on their feet and potentially expand their business. 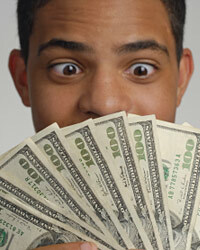 Convenience- Dealing with a peer-to-peer loan is usually very convenient. Depending on what company you use to set it up, you may not have to do much work at all. You simply fill out a form and then set up the payment plan. You will give them your bank account information and they will deduct money from the proper account and put it in another. Higher interest- Most of the time when working with a peer-to-peer program, you will have to pay slightly higher interest than you are used to with a bank. Since these are individual lenders they do not have the economies of scale that a large lender does. Default- When you loan money, there is always a chance of default. If it happens to you it could definitely hurt your business in the process.